When Hundred Reasons signed to Columbia last year they were accused of selling out their punk principles in the name of the dollar. One year later and they're seen as Britain's most important rock bands demanding covers on the rock and indie weeklies and sticking up one finger to all the haters and the detractors who told them they had ideas above their station and they'd soon be back begging for an indie deal. I remember when I first saw them deliver them unique blend of ironic rock fronted by the strangest gangly hairiest oddity known to man. Its seem such a far cry away from a band who our now touted as one of the best Emo (Ed: One of those meaningless media pigeonholes that basically means emotional rock music. Like when has rock music been unemotional) bands around. "Ideas Above Our Station" suffers like many rock albums in the fact that they just can't recreate that live energy on the recorded versions. Sure they give their all, but there is something about being in a pit that can never be recreated in your bedroom (well, apart from those drunken air guitar moments) with a CD. While the first two singles "If I Could" and "I'll Find You" hinted that much of the album would revel in those emo-dirges, it's the more uptempo rockers like "Silver" that really represent Hundred Reasons in their best light. "Shine", full on pill popping energy encapsulated in one and half minutes takes it through to "Drowning" a song steeped in classic 80s melodic rock. Its these twin forces of both the classic rock heritage of say Metallica with the modern age that fuse together to create an angry anthemic blast of beautiful melodies crashing under their own weight of self belief. "Avalanche" perhaps offers a glimpse of the future with the band stripped back just to vocals and sparse guitar. Its the sort of tune that would really benefit from a from a lush orchestral arrangement and flourishes of acoustic guitar and proves that Hundred Reasons can rock quietly when the occasion demands it. 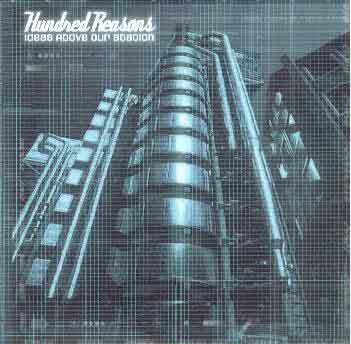 Hundred Reasons are a great British Rock band, but unfortunately "Ideas Above Our Station" doesn't come close to the energy of the live shows and falls well short of American acts like Hoobastank. With so many British acts ready to unleash their albums in the next few months I'd recommend you save your money for the likes of Halo and Skindred.